Hydropower 101: Energy Efficient or Not? Water Matters > Education > Hydropower 101: Energy Efficient or Not? As fossil fuels wreak more and more environmental havoc, playing a major role in speeding up the effects of climate change, many cities across the world are starting to invest in renewable and increasingly reliable energy resources. In the United States, wind energy has become one of the biggest players in renewable resources—especially within the state of Texas. But one widely-used renewable energy source that we hear less about? Hydropower – and it’s time to get acquainted. 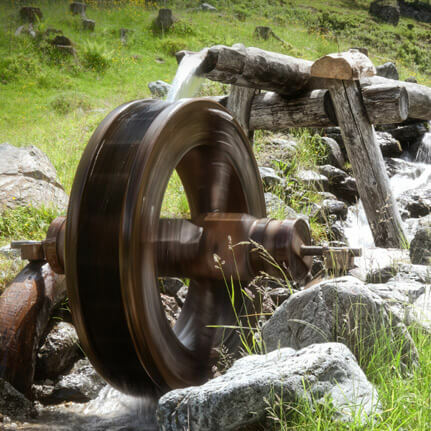 As the word “hydro” implies, hydropower comes from water — specifically, from its movement. There are a few different methods of using that movement to generate electricity. One method is to have energy produced by creating a dam and releasing its built-up water. Other methods rely on water acting as a force, pushing against turbines to generate power. Hydropower is a fantastic alternative to fossil fuels, but here’s the thing: it’s a bit of an environmental frenemy – here’s why. At present, Hydropower is now the second-largest producer of renewable energies within the United States, right behind wind power. But more than that, it’s also one of the oldest means of energy production. Originally used to power wheat production in Greek society over 2,000 years ago, it became a more popular resource during the Industrial Revolution. Then, in the late 1800s, it scaled up to power larger areas, keeping street lamps lit after the world’s first hydroelectric power plant was built in Niagara Falls. In fact, hydropower has been in use for so long it’s a wonder that it isn’t far more widespread than it is. As of 2016, 44 percent of the country’s renewable energy comes from hydropower and is 6.4 percent of the country’s overall energy production. Additionally, hydroelectric power comprises one-fifth of the world’s energy production. So, while hydropower gets overlooked in the headlines, it’s a renewable to contend with. As of 2016, 44 percent of the country’s renewable energy comes from hydropower and is 6.4 percent of the country’s overall energy production. Using hydropower has many upsides. Since hydropower is renewable and not dependent on, say, having workers mine it out of the ground, it’s considered more environmentally-friendly than fossil fuels like coal mining or natural gas — which cause environmental damage in the extraction process — or nuclear energy which creates a significant amount of toxic waste. Another positive of hydropower is that it creates reservoirs that collect rainwater, which can act as an oasis during regional drought. That water storage also acts to supplement other renewable energies like wind and solar when winds are low, or it’s overcast. Additionally, hydropower contributes to market price stability as river water is a public resource that isn’t beholden to market fluctuations. But there are a few factors that don’t work in hydropower’s favor. Let’s dive in. One reason hydropower hasn’t taken more of the U.S. energy market is that it has a high investment cost, it requires a large amount of fuel, and is limited to areas near bodies of water. The amount of hydropower that can be generated, unfortunately, is also dependent on the amount of available water. So, if there’s a drought or there hasn’t been much rainfall in a given area in a certain year, it impacts the amount of hydroelectricity that’s produced, making this renewable energy somewhat unpredictable. Perhaps counter-intuitively, most of hydropower’s downsides are environmental. It sounds crazy — hydropower could help save the earth from the damage of extracting and burning fossil fuels. But it also contributes quite a bit to greenhouse gas emissions. A recent study from Washington State University revealed that the world’s hydropower plants contribute as many methane emissions to the atmosphere as the entire country of Canada. Methane emissions are even worse — 34 times worse — for the ozone than carbon dioxide emissions. The question, though, is how exactly does the generation of hydroelectricity contribute to methane emissions? Hydropower relies on water falling downstream, so it requires a dam. Dams, in turn, create methane emissions because they stagnate the water and that leads to the faster breakdown of organic matter within the reservoir. According to studies reported in the journal BioSciences, this process releases a significant amount of methane gas. Now, this isn’t exactly the fault of hydropower itself, but our system of processing water at dams. Regardless of this fact, methane gas still indirectly ends up being a byproduct of hydropower’s usage. While the methane revelation is a real environmental doozy, there are some additional drawbacks to generating hydroelectric power. For one, it has some serious negative consequences for wildlife. Since hydroelectric power relies on dams, it effectively keeps salmon and other aquatic life from (in the salmon’s case) swimming upstream to reproduce and hinders their mobility within a single body of water. According to National Geographic, hydropower dams can also lead to low levels of dissolved oxygen in the water, which is also detrimental to aquatic life. Moreover, creating reservoirs for hydroelectricity production can displace local human populations, which can have a significantly tougher impact on low-income individuals and families. Hydropower has many upsides and almost as many downsides. In the meantime, you can investigate alternative forms of energy for your own home. Water is truly one of our most abundant resources and one of our most necessary allies, but we need to treat it right so that it can return the favor. If you’re looking to gift your family with clean water for your own home, investing in an under-counter water filter is a great start. If you’re looking to gift your family with clean water for your own home, investing in an under-counter water filter is a great start. We might not be at the place yet where hydropower is a cure-all for our energy woes, but we can take control of our water on an individual level and keep our homes contaminant-free. Because if there’s a great place to start cleansing your environment, it’s in your own home. Our Climate Is Changing - Why Is Water Becoming More Scarce?